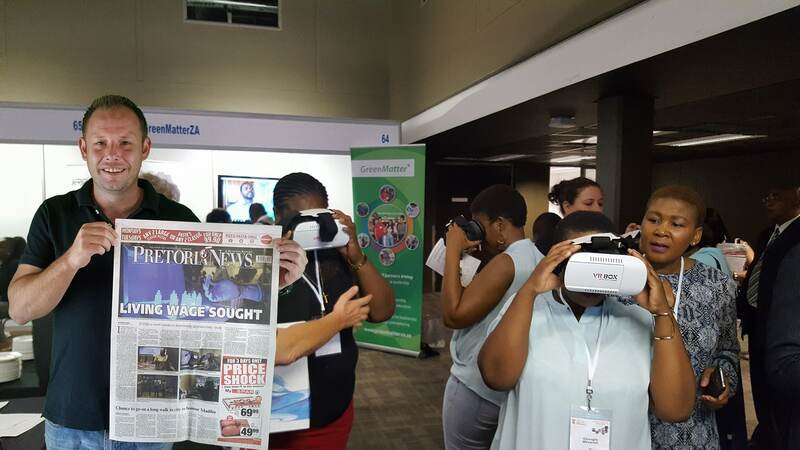 We were commissioned by the North West University to assist them with a Virtual Reality activation at the CSIR. We provided them with our Virtual Reality headsets and activation package. This included Virtual Reality headsets, implementing their VR content solution into the headsets as well as a Technician to assist them at the activation. The North West University won the best activation and most interactive stand at the event. In the photo above Mr. Rudi Snyders (founding member of VR360) holds up the Pretoria Newspaper, the article about the North West Universities exhibition was frontage news! Visitors to the stand had the opportunity to immerse themselves into the North West University campus, and walk around the campus and pre-clinical drug department of the university. We assist companies to create custom virtual reality hardware and software solutions, but also help at event activation. We have build up an impressive amount of Virtual Reality headsets and equipment that we rent out to companies specifically for event activation’s. If you are interested in using virtual reality as part of your event, activation or stand talk to us, and we will assist you with providing you with more information, quotation and actual headsets!